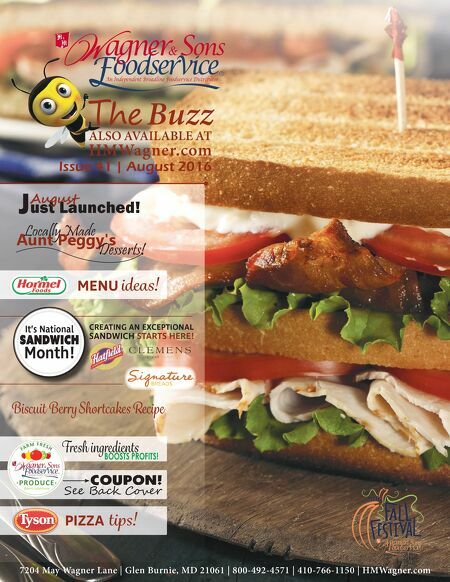 ALSO AVAILABLE AT HMWagner.com Issue 41 | August 2016 The Buzz 7204 May Wagner Lane | Glen Burnie, MD 21061 | 800-492-4571 | 410-766-1150 | HMWagner.com J ust Launched! August Aunt Peggy's Locally Made Desserts! See Back Cover COUPON! Fresh ingredients BOOSTS PROFITS! · P R O D U C E · F A R M F R E S H Biscuit Berry Shortcakes Recipe MENU ideas! PIZZA tips! It's National Sandwich Month! CREATING AN EXCEPTIONAL SANDWICH STARTS HERE!